Few states can match the charm, culture, and soul of The Pelican State. This zest for life makes Louisiana an excellent state to bring the RV. I want to help you on the journey to the bayou, so I’ve compiled my top five RV parks and campgrounds when traveling to and through Louisiana. Whether you're visiting New Orleans – which you should! – or somewhere else throughout the state, this guide will ensure you stay at the best of the best during your travels. The appeal is in all the name, fish, and camp in the heart of Louisiana. Poche’s RV Park has highly rated facilities, 88 pull-through spots equipped with 30/50 amp hookups, sewer, and water. The park also features a clubhouse, showers, laundry, dog walk, playground and more. You’re guaranteed the reel the big one at Poche’s; the park boasts fifty acres of well-maintained ponds stocked with largemouth bass, bream, and catfish. No license is required, and you can keep the fish you catch for a delicious fish fry. Try heading to Poche’s in early May when the town of Breaux Bridge hosts their annual crawfish festival. There’s plenty of fun for both parents and kids at Red Shoes Park at Coushatta Casino Resort. You get 40 acres of well-maintained grounds, concrete pull-through pads, and full utility hookups. All sites come with free cable and Wi-Fi access. There are two bathhouses, laundry facilities, a dog park, free shuttle service to the casino. Red Shoes Park has received 10s across the board from the Good Sam RV Club. Fun at the park is found in the heated pool with giant water slides, in the well-stocked clubhouse or out on horseshoe pits. Adults have the casino, with 3000 slots, 70 table games, two nightclubs, live entertainment, fine dining and more. For kids, there is the Kid’s Quest & Cyber Quest, a supervised arcade with tons of fun and interactive games. This park is named as it gets an A-plus in our book. A+ Motel and RV Park has everything an RV wants and needs. All 134 concrete pads are outfitted with full utilities as well as Wi-Fi and cable TV. There are plenty of bathhouses, showers and laundry facilities to take care of all things dirty along with picnic tables, BBQ pits, a dog run and more, all under 24-hour security. Throw your line out at their private fishing pond, take the boat out or relax in the adults-only heated pool. Just choose which body of water you want to relax or get around on, Lake Charles, Prien Lake, and the Calcasieu River are nearby. You’re also right next to the great flora and fauna of the Creole Nature Trail. We couldn’t make a Louisiana list without a park that gets you into the spirit and action of downtown New Orleans. 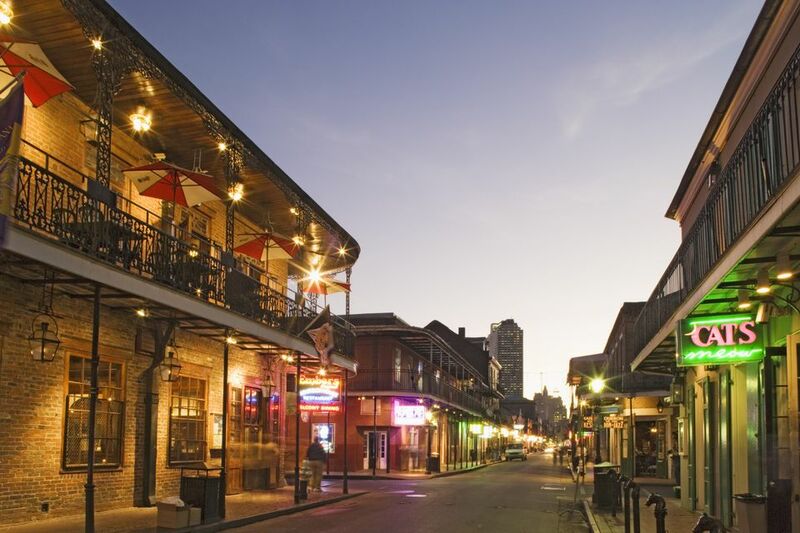 French Quarter RV Resort will be your home base to explore all the sights and sounds of Bourbon St. They have full utility hookups including cable and Wi-Fi to take care of your creature comforts as well as spacious and clean bathrooms, showers and laundry facilities. They also have a recreation room and fitness center. You stay at French Quarter RV Resort for quick access to downtown New Orleans and all the fun it provides. You can even walk to downtown New Orleans from the park. Explore some live music, eat some fabulous food or just people watch down the streets. You’re in New Orleans, let loose! Get some relaxation at one of Louisiana’s most highly rated state parks. Don’t expect luxurious amenities but Chicot State Park has what you need in 198 sites with water and electric hookups and a central dump station to take care of your waste. The park also provides showers, laundry, group pavilions, a boat launch, and even an outdoor classroom. Chicot itself has plenty of opportunities for outdoor recreation with 6400 acres and miles of hiking and biking trails, canoeing, birdwatching, fishing, boating and more. Nearby you also have the Zydeco Cajun Prairie Scenic Byway and the Prairie Acadian Cultural Center – Jean Lafitte National Historical Park and Preserve. Louisiana may not be the biggest state in the union, but it has so much to offer RVers and travelers alike. This is one state you might have to visit several times to see it all RVing. If Louisiana isn’t on your RV bucket list – you’re missing out on an adventure.